Squid Cooked in Red Wine – Kalamarakia Krassata This delicious squid recipe in red wine – Kalamarakia Krassata is another imaginative way the Greeks have to serve squid or calamari, a popular seafood in Greece. 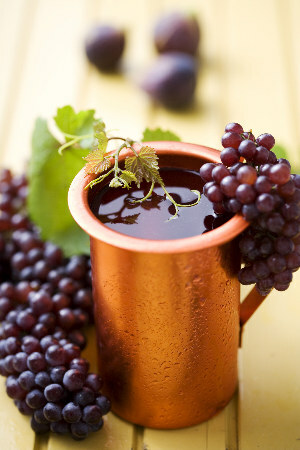 Krassata means cooked in wine. This method of cooking using wine, which helps to tenderise the meat, is used in various Greek recipes, such as Octapodi Krassato Octopus in Red Wine. 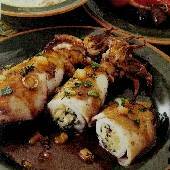 Other variations to this squid recipe will use meat, such as beef. In this squid recipe, calamari is first fried, then slowly simmered in a sweet onion, tomato and herb infused red wine sauce, until soft and tender, creating a delicious rich, thick sauce. Small squid are best as they are more tender, but you can use larger ones, they will need a little longer to cook to soften. Try this squid recipe when you fancy a calamari dish but want something other than squid fried in batter! Clean the squid by pulling the head away from the body. Remove and discard everything inside the body and clean thoroughly. Cut the tentacles away from the rest of the head. Clean the tentacles well and discard the rest of the head. Slice the squid bodies into rings or strips about 1 inch / 2.5cm wide. Heat the oil in a large pan and saute the onions. Add the squid to the pan, fry them on high heat, until all the liquid they produce has evaporated. Slowly pour the wine into the pan, then add the rest of the ingredients. Cover and leave on a low heat for a gentle simmer for about 1 hour, stirring occasionally. The squid should be very soft and tender and the liquid will have reduced to a lovely rich thick sauce. 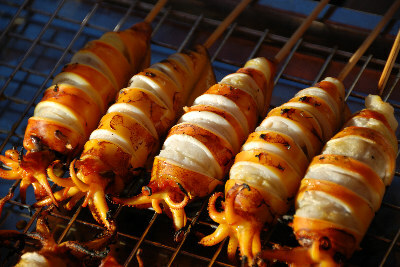 Serve this squid recipe with rice or pasta, salad and of course, fresh crusty bread. Alternatively this makes a great dish to make as part of a meze – a serving of food to go with drinks – red wine or ouzo – perfect!